Christopher Paul "Chris" Colfer (born May 27, 1990) is an American actor, singer, author, screenwriter, and producer. He gained international recognition for his portrayal of countertenor Kurt Hummel on the hit television singing series Glee (2009-2015). Colfer's portrayal of Kurt has received critical praise for which he has been the recipient of several awards, including Best Supporting Actor in a Series, Miniseries or Television Film at the 2011 Golden Globe Awards and three consecutive People’s Choice Awards for Favorite Comedic TV Actor in 2013, 2014 and 2015. In April 2011, Colfer was named one of the 2011 Time 100, Time's list of the 100 most influential people. Colfer was born in Clovis, California, the son of Karen and Timothy Colfer. He has Irish ancestry, and has stated: "I'm very Irish, my family is all Irish and St. Patrick's day in my house is crazy." As a child he was confined to a hospital bed for three months following lymph node surgery, which left a scar on his neck, and which he credits as one of the difficult experiences that made him interested in fictional worlds. At a very early age, Colfer showed a passion for writing. He was "born wanting to be a storyteller", using both writing and acting as ways to entertain people and escape reality. His grandmother was his first editor, advising and encouraging him in elementary school when he first attempted to write a fairytale-inspired novel, which would later become The Land of Stories. In 2012, Colfer dedicated his first published novel to her, and quoted her: "Christopher, I think you should wait until you're done with elementary school before worrying about being a failed writer." The first show he was involved in with community theater was West Side Story. He also appeared in a production of The Sound of Music as the character Kurt von Trapp, the musical protagonist Maria von Trapp's stepson. Colfer’s resemblance to the Kurt von Trapp character later served as inspiration for the name of his Glee character. At the age of eighteen, Colfer starred as Russel Fish in Russel Fish: The Sausage and Eggs Incident, a short film where an awkward teenager must pass a Presidential Physical Fitness test or fail gym class and lose his admission to Harvard University. Colfer's first TV role came in 2009 when he was cast as Kurt Hummel on Fox's Glee. Kurt is a fashionable gay countertenor who is routinely bullied at school, not only for being gay, but also for being part of the very unpopular Glee Club. Colfer auditioned for the part of Artie Abrams, who uses a wheelchair, a role which eventually went to Kevin McHale. Colfer won the 2011 Golden Globe for Best Supporting Actor in a Television Series for his performance as Kurt Hummel. In his emotional acceptance speech, he thanked Ryan Murphy for being his "fairy godfather" and dedicated the award to kids who have been bullied and told “they can't […] have what they want because of who they are.” He was twice nominated for an Emmy Award in the Outstanding Supporting Actor in a Comedy Series category for his portrayal of Kurt. The second book in the series, The Land of Stories: The Enchantress Returns, was released on August 6, 2013. It debuted at number two on The New York Times Best Seller list, and by the end of 2013 it had spent eleven weeks in the top fifteen for Children’s Middle Grade books. Colfer landed a deal with Disney Channel to adapt the book "The Little Leftover Witch" for a television pilot. He also wrote another movie, set in an asylum, which he planned to appear in as a supporting actor. However, both of these projects have been delayed with no expected dates for production. On January 28, 2014, it was announced that Colfer will star in a new 3D CG animated family film, Robodog, as the voice of the title character. The film, which will costar Ron Perlman, is described as “a classic, heart-warming adventure story about an unlikely duo who couldn't be more different.” The film’s director, Henry F. Anderson III, said Colfer is “perfect” for the project because he “has an appealing, youthful voice which fits right in with our lead character, KC, who is above all a charismatic entertainer.” Vocal recording for the film began on February 1, 2014. After a few months of planning, it was revealed on March 17, 2014, that Chris had been asked by Glee's producers to write an upcoming episode. About his acceptance of the offer, Colfer said: “I’ve been asked in interviews if I ever wanted to write [an episode of Glee], and I said, ‘Absolutely not because it was not my world.’ I didn’t want to tamper with someone else’s image. Then they were like, ‘Here, come tamper.’” The title of the episode, which aired on May 6, 2014, is "Old Dog New Tricks". In 2014, Colfer guest starred on an episode of Hot in Cleveland playing Tony, Victoria's son. On March 31st, 2015, Jane Leeves posted an image on her official Twitter account, confirming that Colfer will be returning to an episode for the show's final season entitled "All About Elka". On May 14 it became a public knowledge that the biopic Colfer has been mentioning for almost a year is going to be about Noël Coward with the working title "Noel" and Chris is going to play the main role. Colfer has since been in London, preparing for the role. The film will be directed by Joe Stephenson and filming is expected to begin sometime during the summer of 2015. Colfer's younger sister, Hannah, suffers from severe epilepsy, and often experiences over fifty seizures in an hour. 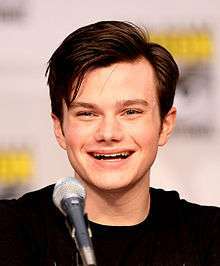 Colfer has commented that when he was younger he used acting as a method of escaping the stress involved with having a disabled family member. Colfer is openly gay, and said that while his parents were very conservative, they were supportive after he came out, but he was routinely bullied at school, and it eventually got so bad that his parents pulled him out of middle school and home-schooled him for a year and a half. Colfer also was a co-chair for the Elton John AIDS Foundation Academy Award Party in 2013 and 2014. He also is a coalition member of Uprising of Love, an organization which supports the safety and dignity of Lesbian, Gay, Bisexual, Transgender, and Intersex (LGBTI) Russians. He served on the host committee for Uprising of Love: A Benefit Concert for Global Equality. On October 25, 2014, Colfer made an announcement on his Twitter account encouraging fans to donate to the HP Alliance. He also has donated signed copies of his books to the fundraiser. In the past, he also has tweeted support for the Adopt the Arts Foundation's effort to Save the Arts, as well as talked about the importance of the arts in education. Colfer also has contributed drawings to Doodle 4 NF in the past, including in 2013 and 2015. Doodle 4 NF is an annual fundraiser for the Neurofibromatosis Network. In 2016 he landed the role as Christopher in Absolutely Fabulous: The Movie. He also appeared as a guest judge in Chopped Junior. ABC News reported that Colfer was among the celebrities who donated to Hillary Clinton’s campaign in 2015. Colfer donated $5,400, maxing out for both the primary and general election cycle. ↑ "Monitor". Entertainment Weekly (1209/1210). Jun 1–8, 2012. p. 35. ↑ "Show Tracker". Los Angeles Times. ↑ Ayers, Dennis (May 27, 2010). "Chris Colfer, Birthday Boy". AfterElton.com. Retrieved May 1, 2011. 1 2 Vena, Jocelyn (Jan 16, 2011). "Glee Star Chris Colfer Dedicates Golden Globe To Bullied Kids". mtv.com. Retrieved Feb 2, 2014. 1 2 Goodacre, Kate (Jan 9, 2013). "People's Choice Awards: Glee's Chris Colfer flattered by fanfiction". digitalspy.com. Retrieved Feb 2, 2014. 1 2 Naoreen, Nuzhat (Jan 9, 2014). "Chris Colfer Says He Feels Fantastic After Winning People's Choice Award". blog.peopleschoice.com. Retrieved Feb 2, 2014. ↑ Bentley, Rick. "Emmy nod 'surreal,' Clovis East grad says – Clovis: News". fresnobee.com. Retrieved November 9, 2011. ↑ tv (August 19, 2011). "MSN UK". Tv.uk.msn.com. Retrieved November 9, 2011. 1 2 Carpenter, Susan (July 15, 2012). "The Writing Life: Chris Colfer of 'Glee' inspired by fairy tales". latimes.com. Retrieved Feb 2, 2014. ↑ Lodge, Sally (June 6, 2012). "BEA 2012: A Bountiful Breakfast Menu". publishersweekly.co. Retrieved Feb 2, 2014. ↑ Colfer, Chris (July 2, 2013). The Wishing Spell. Little, Brown Books for Young Readers. ISBN 978-0316201568. Retrieved July 1, 2014. To Grandma, for being my first editor and giving me the best writing advice I’ve ever received: "Christopher, I think you should wait until you’re done with elementary school before worrying about being a failed writer." ↑ "'Glee' cast talks of new season, how show changed them", Manila Bulletin, October 10, 2011, Retrieved October 11, 2011. ↑ Chris Colfer on Glee wiki Gleewiki on Fox.com. Retrieved November 14, 2009. Archived September 7, 2009, at the Wayback Machine. ↑ Goldberg, Lesley. "Just One of the Guys". Advocate.com. Retrieved November 9, 2011. 1 2 Glee’s Chris Colfer Reveals Real-Life Story Behind Kurt’s Diva Moment People, November 12, 2009. 1 2 Kugel, Allison (April 26, 2010). "Glee Star Chris Colfer Shares His Best Behind-the-Scenes Moments and Surreal Adventures". PR.com. Retrieved May 28, 2011. ↑ "Glee Does West Side Story". ↑ Malcolm, Shawna (May–June 2010). "Let It Glee". Emmy. North Hollywood, California: Academy of Television Arts & Sciences. XXXII (3): 102–109. ISSN 0164-3495. OCLC 4629234. ↑ Murphy, Ryan. "Glee Project Season Two Finale". Oxegen. Retrieved August 17, 2012. ↑ "Chris Colfer". Television Academy. ↑ "Chris Colfer Signs Children's Book Deal – Today's News: Our Take". TVGuide.com. June 8, 2011. Retrieved November 9, 2011. ↑ New York Times, New York Times Best Sellers August 5, 2012. Accessed February 19, 2013. ↑ "Chris Colfer Tops New York Times Best Sellers List". advocate.com. 1 2 "#1 New York Times Bestselling Author Chris Colfer Builds on Success of Land of Stories Series with a New Three-Book Deal at Little, Brown Books for Young Readers". businesswire.com. Oct 17, 2013. Retrieved Feb 2, 2014. ↑ "The Land of Stories: A Grimm Warning". hachettebookgroup.com. ↑ "The Land of Stories: Beyond the Kingdoms". hachettebookgroup.com. ↑ "Glee's Chris Colfer Makes Leap to Big Screen for Lightning". TVGuide.com. Retrieved December 8, 2010. ↑ "Glee Stars 'Touched' By Pitt & Clooney's Support Of '8'". Access Hollywood. accesshollywood.com. Retrieved March 18, 2012. ↑ "YouTube to broadcast Proposition 8 play live". pinknews.co.uk. Retrieved March 18, 2012. ↑ Tim Stack, "Glee star Chris Colfer discusses his new pilot for Disney and Kurt's return to McKinley – EXCLUSIVE", insidetv.ew.com, April 22, 2011. ↑ Malkin, Marc (Jan 9, 2013). "Chris Colfer's New Asylum Movie "Completely Different" From Ryan Murphy's American Horror Story". eonline.com. Retrieved Feb 2, 2014. 1 2 Blair, Gavin J (January 28, 2012). "Chris Colfer, Ron Perlman to Voice 'Robodog' Anime Feature". hollywoodreporter.com. Retrieved Feb 2, 2014. ↑ uncredited (Jan 28, 2014). "Chris Colfer and Ron Perlman Will Lend Their Voices to RoboDog". comingsoon.net. Retrieved Feb 2, 2014. ↑ Ausiello, Michael (March 17, 2014). "Glee Exclusive: Chris Colfer to Pen Episode". tvline.com. Retrieved Mar 20, 2014. ↑ Swiftfirst=Andy (March 19, 2014). "Chris Colfer on Writing Glee Episode: Expect 'Animals and the Elderly' (But No Miley Cyrus)". tvline.com. Retrieved Mar 20, 2014. ↑ "Glee's Chris Colfer to star in Noel Coward biopic". screendaily.com. ↑ Chris and Hannah Dealing with Severe Epilepsy. Success Circuit, April 16, 2012. ↑ Black, Rob. "Hannah Colfer's Story". GleeFan.com. Retrieved March 30, 2010. ↑ "Chris Colfer (from Glee) | Trojan Vision Television". Trojanvision.com. April 18, 2010. Retrieved November 9, 2011. ↑ BBC. Chris Colfer show his sai swords skills – Friday Night With Jonathan Ross". Friday Night With Jonathan Ross. Retrieved June 19, 2010. ↑ Chris Colfer & Elmo Talk About Bullying. YouTube. December 10, 2013. ↑ CHRIS COLFER Extended Interview - Course of the Force 2013: Day 1. YouTube. July 12, 2013. ↑ Gajewski, Ryan (June 20, 2014). "Anne Hathaway, Jennifer Garner Encourage Education for Young Women in PSA". The Hollywood Reporter. Retrieved July 1, 2014. ↑ Ocamb, Karen (March 28, 2014). "Melissa Etheridge 'Uprising of Love' Music Video a Kiss to LGBT Russians". frontiersla.com. Retrieved July 1, 2014. ↑ "Uprising of Love". uprisingoflove.org. ↑ "Chris Colfer Adopts a Senior Cat". People. ↑ Koerner, Allyson (December 15, 2011). "Chris Colfer Creates Pet Pictures for Animal Rescue". ecorazzi.com. Retrieved July 1, 2014. ↑ Peter Vidani. "The Harry Potter Alliance (Harry Potter taught the world to believe in magic...)". tumblr.com. ↑ "Chris Colfer on Twitter". Twitter. ↑ Glee's Chris Colfer talks about school budget cuts and saving the Arts!. YouTube. April 26, 2012. ↑ "Doodle 4 NF - Gallery - Chris Colfer #1". doodle4nf.org. ↑ "Doodle 4 NF - Gallery - Chris Colfer #2". doodle4nf.org. ↑ "Doodle 4 NF - Annual fundraiser for Neurofibromatosis". doodle4nf.org. ↑ "Chris Colfer: First Book Charity Tee!". represent.com. ↑ ABC News. "Beyonce, Spielberg, and Sting: 33 Interesting People Who Wrote Big Checks to Hillary Clinton". ABC News.